Sweet Nickname – Sweet Pea, Popeye and OliveOyl’s baby! I know, hubby and I were discussing that yesterday…it could have been their nephew too. Thank you for the nomination, we gladly accept. You really deserve this award since you are “super sweet” and oh so fashionable! Congratulations. You are super sweet!!! Enjoy your week. Thanks for the nomination!! You’re such an awesome person! Congratulations…you are very sweet! Thank you for the nomination…your visits are my reward! 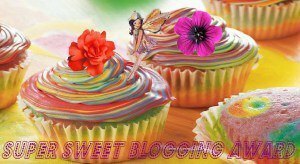 Thank you and thanks for being a sweet blogger as well!